The control of material properties using ultrashort pulses of light is a promising route for the development of future electro-optical storage and high speed switching devices. 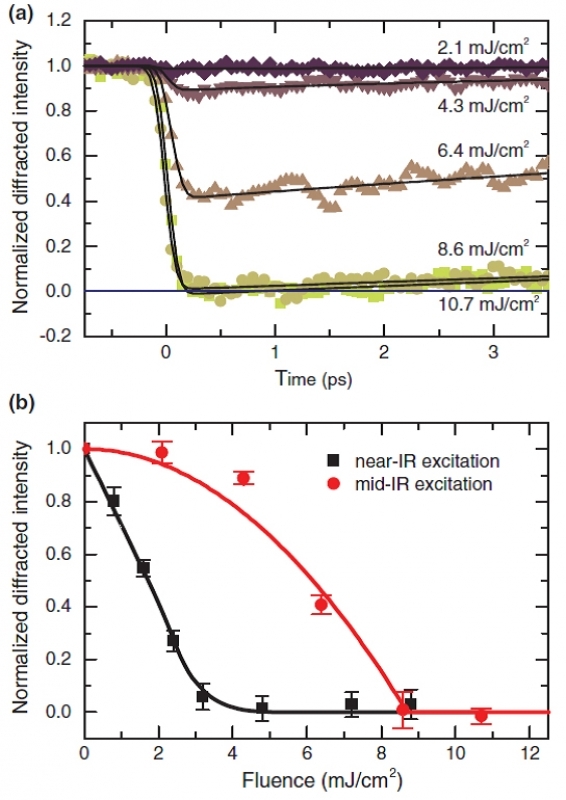 One very fruitful approach is to use low energy excitations in the mid-infrared spectral range to realize the targeted changes [1,2]. The selectivity of the process minimizes the entropy added to the system as compared to the excitation of electronic transitions in the ultraviolet to near-infrared wavelengths range. In particular, the transient enhancement of superconductivity initiated via nonlinear phonon-phonon interactions is a nice example that has recently received large attention . In this work, we report of a new route to manipulate the electronic properties of a material via vibrational excitation. Investigating the dynamics of the charge order in a manganites film following resonant excitation of a phonon mode to large amplitude, we find direct nonlinear coupling between the excited mode and the electronic degrees of freedom. In particular our work demonstrates that the nonlinear electron-phonon coupling is sufficiently strong to drive the insulator-metal transition in this material. The generalization of our approach leads to new ways of manipulating materials e.g. shaping their properties on ultrashort timescales.